Peter and Rosemary Grant have been studying the phenomenon of speciation in Darwin’s finches for 35 years, using every technique available to them from molecular biology to population ecology. They have written several books about various aspects of their work and even were the focus of a Pulitzer-prize winning book. But there has not been a comprehensive yet scholarly book that has captured the essential highlights of their lifetime work, until now. 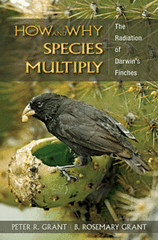 How and Why Species Multiply: The Radiation of Darwin’s Finches by Peter R. Grant and B. Rosemary Grant (New Jersey, Princeton University Press; 2008) provides an important yet accessible overview of the scientific information known about Darwin’s finches without becoming bogged down in statistical analyses and methodologies, nor with the historical distractions that often accompanies writings about these birds. This well-written and readable book weaves together the effects of adaptation to different ecological niches with the evolution of the Galapagos finches. The authors start with the group of South American finch-like tanagers that arrived on the Galapagos archipelago between 2 and 3 million years ago and then spread throughout the islands. These pioneering birds experienced differential survival and breeding success as they adapted to dramatically different ecological niches where ever they found themselves, giving rise to two main lineages, the Certhidea warbler finches and the Geospizinae finches. The Geospizinae finches then radiated into several more lineages, beginning with the Cocos Island finch, the sharp-beaked ground finches, and the vegetarian finch, followed later by the appearance two more groups; the ground finches and the tree finches, for a combined total of 14 or 15 species total (the Grants classify them into 14 species). As these birds have adapted to different diets, it is interesting to note that all of these birds consume a tremendous variety of items, ranging from seeds to fresh blood. The Grants realize that providing a reasonable framework for understanding how Darwin’s finches evolved into the forms that we see today, it is necessary to understand the historical context of these birds. To do this, the Grants estimate phylogenetic relationships between the 14 species of Darwin’s finches using molecular data (chapter 2), then they focus on microevolution (which will no doubt draw out the religious wingnuts in force). They explore the several scientific hyptheses describing how speciation occurs (chapter 3), and compare those to their own data on these birds, collected during 35 years of research. By meticulously examining these data, they investigate what happens when an island is colonized and a new population becomes established there (chapter 4), how adaptation through natural selection occurs (chapter 5), how competition for resources contributes to natural selection and to evolution (chapter 6), and how individuals choose their mates and what constitutes a barrier to interbreeding (chapter 7). The authors then explore the causes and consequences of making a “mistake” when choosing a mate; hybridization (chapter 8), and discuss how to recognize species, especially since hybridization occasionally occurs between perfectly sound species (chapter 9). After presenting those data, the Grants then focus on the differences between species that appeared early versus late during the radiation, comparing their responses to changing ecological opportunities, and explore the balance between speciation and extinction (chapter 10). They also ask the intriguing question as to why Darwin’s finches radiated when other birds in the same environment did not (chapter 11), and last, the authors provide a broader context by describing the three hypothetical stages that all evolutionary radiations pass through and they discuss the reasons for placing Darwin’s finches into the first stage. This book is a surprisingly compact 218 pages long, and is filled with the latest knowledge about Darwin’s Finches and what they are teaching us about speciation. It includes 31 color plates, 58 maps, graphs, charts, diagrams and sonograms, and three tables that describe data such as phylogenetic reconstructions using microsats, climate change data, variations in finch population sizes over time, and differences between species’ songs, body sizes, diets, hybrid survival, microsatellite loci hetrozygosity, beak size variances and explanations for the underlying genetic mechanisms that can affect beak size and shapes, just to name a few. Additionally, the book has a 7-page glossary where particular words are defined so those who are not familiar with the terminology are brought up to speed, a 26-page bibliography where the interested reader can explore the primary literature, along with a 9-page author index and a 7-page subject index. This book is part of the ongoing Princeton Series in Evolutionary Biology. Based on my reading of this book, if all the volumes in this series are of equivalent quality, then the entire series is a very worth-while addition to every evolutiuonary biologist’s personal library. Some of you know that I am a scientist who researched the evolution and speciation of parrots of the South Pacific Ocean, so reading this book was an intellectual love affair, providing a long-desired glimpse into my own lost world of scientific wonder that I sacrificed so much to attain. But beyond my own passion for the topic of speciation, this book is also a wonderful addition to the bookshelves of all biologists and ornithologists as well as science and natural history libraries. This book is well organized and the writing is so clear and accessible that college students, particularly undergrads and graduate students, will find a lot in this slender volume to stimulate their own passions for the subject. I think so highly of this book that, if I was so lucky as to teach a university course about speciation for advanced undergrads and grad students, I would use this as one of the required texts. But that said, I think that serious birders will also find this book interesting, as will those who are fascinated by the Galapagos Islands and Darwin’s famous Finches. Peter R. Grant is the Class of 1877 Professor of Zoology at Princeton University. His books include Ecology and Evolution of Darwin’s Finches. B. Rosemary Grant is a senior research scholar in the Department of Ecology and Evolutionary Biology at Princeton University. She is the coauthor, with Peter R. Grant, of Evolutionary Dynamics of a Natural Population: The Large Cactus Finch of the Galápagos. This entry was posted in Book Review, Speciation and tagged birds, book review, Darwin's finches, evolution, Galapagos finches, How and Why Species Multiply, ornithology, Peter Grant, Rosemary Grant, speciation. Bookmark the permalink. 1877? That fellow must be getting quite long in the tooth by now! Seriously, though, that was a great review and I’m definitely adding it to the Wish List at Amazon. yeah, weird, huh? i checked that title for peter and that’s what several sites say, so .. i dunno. the mind boggles. I would presume that Grant occupies a “chair” of Zoology endowed by the Class of 1877. Co-inky-dinks are so cool. I just happened to run across a video yesterday of a talk given on 2/14 by Jonathan Weiner at the Columbia University Center for the Study of Science and Religion. The author Jonathan Weiner follows the career of two biologists, Peter and Rosemary Grant, who have spent twenty years proving that Charles Darwin did not know the full strength of his theory of evolution. On a desert island among the Galapagos, Daphne Major, the Grants are showing that among the finches of the Galapagos, natural selection sometimes takes place so rapidly we can watch it at work. i’ve read Weiner’s book, several times, in fact. it deserved to win the Pulitzer Prize.